Whenever there’s a slowdown on Iowa’s roadways, every second counts to prevent crashes or secondary crashes. That’s why the Iowa Department of Transportation (DOT) has invested in putting together traffic incident management (TIM) plans to provide coordinated, safe, efficient, and timely management of highway incidents. Screen shot of the TIM Dashboard tool. Those plans mean that at high traffic areas and interstates, there’s a coordinated effort among multiple agencies to alert drivers and reroute traffic to a pre-arranged course. More than 800 of those TIM plans exist throughout the state. Iowa State University’s Institute for Transportation (InTrans) has been working with the Iowa DOT to make those plans easier to access with a TIM Dashboard, and save those critical seconds. The TIM Dashboard is publicly available here, and it’s being unveiled as part of TIM Awareness Week, which is Nov. 11 through 17. 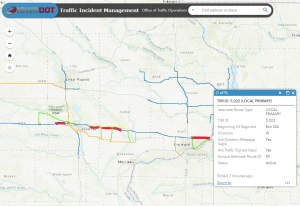 The dashboard includes a map of Iowa with highlighted routes, where emergency responders, police, and other local officials can click on any part of the highlighted route to access quick information on the TIM plan for that area, and then link to the full plan. The idea is that the map can always be up-to-date, and quickly accessed on a desktop computer or mobile device whenever and whatever incident occurs. The visualization also opens up opportunities to see how planned routes may need to be revised, by seeing the roadway layout and where traffic signals exist, for example. Jared Smith, Iowa DOT Traffic Incident Management coordinator, has worked closely with InTrans to develop the TIM Dashboard. “Our goal in TIM is to respond to incidents in a timely manner, keep drivers moving, and keep people safe, this dashboard tool will make those efforts easier,” Smith said. Theresa Litteral, who works with a variety of agencies as the statewide multidisciplinary safety teams (MDST) facilitator to develop these plans, said the coordination between the agencies is essential and incredible. She noted there can be differences between the data about an incident and what the first responders experience on the ground, so it’s necessary to form relationships and continue to evolve the TIM plans. “It’s really more than anything a coordination and communication of efforts,” Litteral said.